P/2012 F5 was discovered by Alex Gibbs on images taken with the 1.5-m f/2 reflector of the Mount Lemmon Sky Survey (part of the CSS) on Mar. 22.28. He described the comet having a stellar coma and a long, narrow tail of length 7.3′-7.4′ in PA 292.5 deg. The object was placed on the NEO Confirmation Page under the temporary designation TF85899. I observed it on Mar. 23.02, and I confirmed its cometary appearance. Stacking all my images (conditions were not optimal and flat field was not very good) a straight and narrow tail is visible for at least 6.5′ in PA 292°. The nuclear condensation was only slightly brighter than the tail, so astrometry was quite difficult. Results were published in CBET 3069 (subscription required) and astrometry, together with preliminary elliptical orbital elements, in MPEC 2012-F87. MPC subsequently linked this object with other one-nighters back to Feb. 20: with this arc, its short period was confirmed (MPEC 2012-F91). 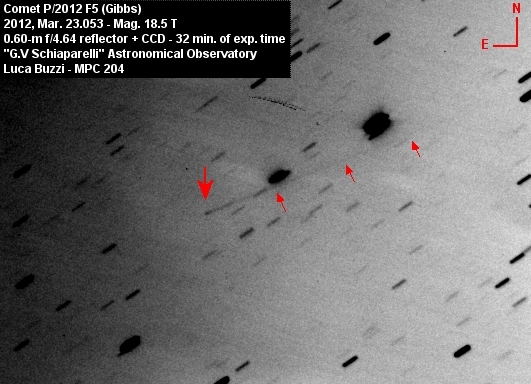 P/2012 F6 was also discovered by Alex Gibbs the following night with the same telescope, but it was officially named Lemmon because he did not recognize its cometary appearance. It was in fact placed on the NEO Confirmation Page as an asteroid. It was then observed by several observers, including me on Mar. 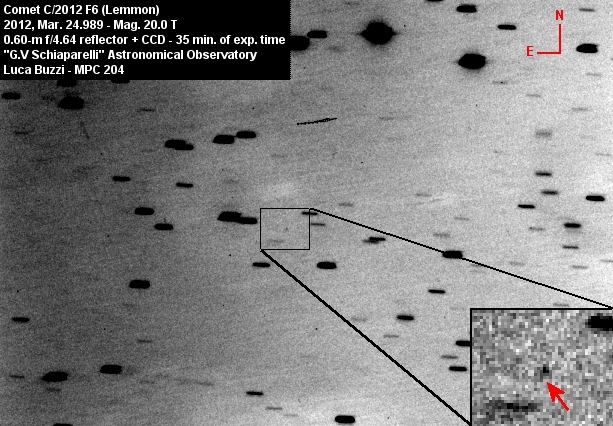 24.94, and its cometary feature was detected. My stacked images revealed a softer appearance on the object’s eastern edge with a possible extension in PA around 120 deg, even if conditions were not optimal, as the night before. Results were published in CBET 3070 (subscription required) and astrometry, together with preliminary parabolic orbital elements, in MPEC 2012-F88.